This piece was inspired by a photo I saw of Hokkaido's famous "Blue Pond". 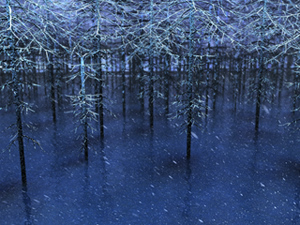 My first version of this render kept the tropical blue from the original pond, but I am trying out a more wintry color palette here. Believe it or not The Dreamer and this scene sprang from the same root, even though they couldn't be more different tonally. "What we're seeing out our window...."
I LOVE this! Amidst the snowstorm, there is a serenity and stunning silence to this image. The heart of winter, and beautifully so. Living in Japan, I love seeing these Japan-inspired backgrounds. Keep it up! The trees look like they're upside down. The bird (coloration looks like a cardinal, maybe?) is about 2/3 up on a branch, left side of the more prominent tree on the right. This version is much more convincing! The seemingly technical (not artistic) problems with the water on previous versions are far less with the fog or ground blizzard in this one. Love the little crested bird hunkered down in the storm. Absolutely love this one Ryan!! !the fog is awesome!!! I love the added fog. This is better than ever! Which size did you select and what is the combined screen-res of your setup? i have a tri monitor setup and switched it to Tile but see multiple display images. thoughts? But I think it could use something more to attract the eye. I love how it reminds me of our winters here in Mass. Too soon for winter! Really like the deeper blue coloration in this version; before it was more gray than blue. 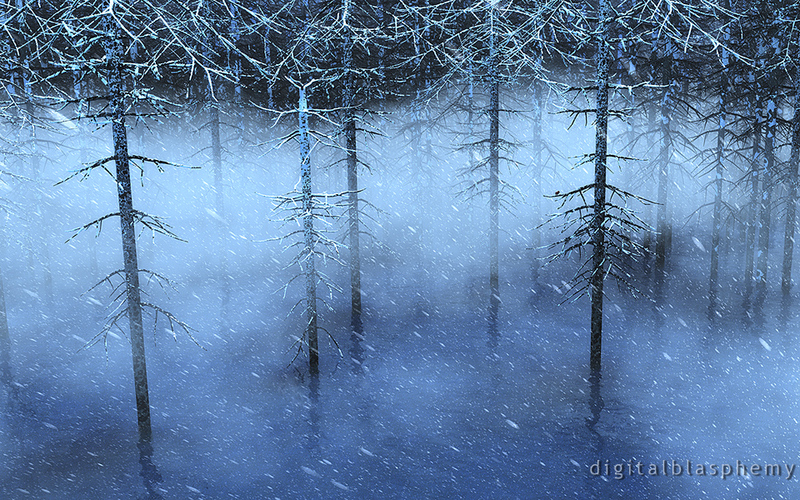 This gives the piece a "winter at dusk" look and feel. I like the name change as well. This piece is not readily apparent what the vantage point is, as it appears there are trees going upwards and trees going downwards on the top edge, meaning we're looking out on a scene from within the trees or something with the far treeline isn't right. The trees coming out of the water aren't very distinct either. This piece could use some more contrast to improve clarity. Ohh, much better. I like it. Makes me want to turn on the fireplace. I also see it more as an abstract than a nature scene, but it really isn't my thing. That being said, I'm still glad that you made it and looking forward to seeing how it turns out in the end. I like it. Really puts me in the mood for the cooler temps ahead. 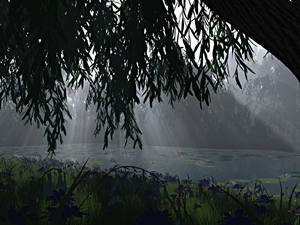 Will you also be doing different seasons using the same scene? I always liked those. I've created a new render with and updated water texture. You might need to refresh your browser (Shift-F5) to see the new image. The trees and snow looks lovely but the water is a little confusing to the eye. At first look it seems to be more like a fog that just obscures the trees. If it was water I'd expect to see more color in it and more distortion in the reflections. If it was ice I would expect to see snow accumulated on it and no reflections. It almost seems like a strange amalgamation of ice, snow, and water. To me I see this as more of an abstract than a nature scene. For whatever reason I dont see the water and cant tell what is tree or what is reflection. I love this render. It really has the winter feel. Amazing Ryan. And Happy Birthday! I really love this render. 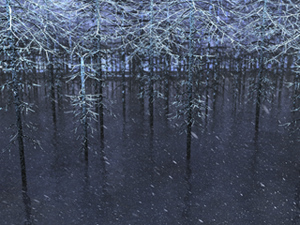 The water underneath the trees is much improved from the preview version; the trees' reflections also make it clear that it's water rather than snow. But since I'm familiar with the image that inspired this render, I'll be interested to see what other members think. The title is borrowed from the words of House Stark in George R. R. Martin's "A Song of Ice and Fire".